Bring the whole family for a fun-filled evening or afternoon of dancing and music in a friendly, informal atmosphere. Free refreshments. 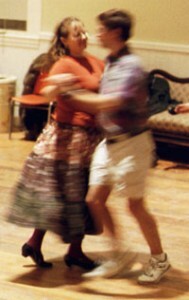 Free beginners’ workshop before the evening dances. Music provided by OH, CONTRAire! Various callers. No experience necessary. Watch a barn dance video! Sunday Afternoons 3 – 5 p.m.
Saturday Evenings 7:30 – 10 p.m. Arrive by 7:00 p.m. for our Beginner’s Workshop.